On the earth, all naturally occurring muons are created by cosmic rays and usually penetrative of ordinary matter. 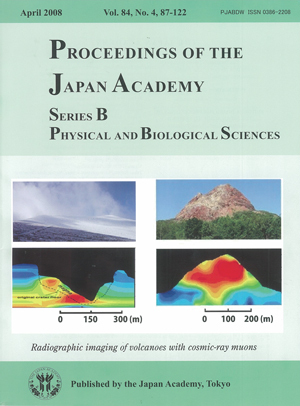 Cosmic-ray muon radiography of a volcano is the use of such cosmic-ray muons to view the internal density structure of a volcano. A cosmic-ray muon detector, comprising nuclear emulsion films in a light tight holder, is placed at the foot of the volcano to be inspected, and records the events of cosmic-ray muons passing through the volcano for the required length of time to image the internal structure adequately. Analysis of the data yields a map of transmitted muon intensity along these paths, from which an average density can be obtained along a vertical cross section of crater parallel to the horizontal edge of the detector. The left panel points to two high density anomalies located between the original pre-2004 eruption crater floor and the post-2004 eruption crater profile of Asama volcano. A low-density anomaly is also imaged immediately below the pre-2004 eruption crater floor. The right panel shows the result of the muon radiography carried out on the Showa-Shinzan lava dome. The cosmic-ray muon technique has much higher resolving power than conventional geophysical techniques, with resolution up to 15 meters allowing it to see throuth the size and shape of the conduit beneath the lava dome. 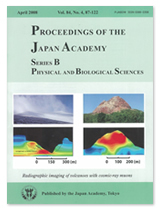 Dr. Tanaka and Dr. Yokoyama demonstrated that the integrated application of cosmic-ray muon radiography and conventional geophysical techniques could provide us a novel approach to quantitative discussion of magma ascent processes throuth the conduit (details; see inside).